The Inaugural adidas Boost Back Bay Mile is a road race that will test your speed in the heart of Boston. The course takes you down Newbury Street, to Gloucester Street, and then make a turn down Boylston Street to the finish line on the specially constructed sprint track that features the same surface you saw at the Olympic Games in Rio de Janeiro. 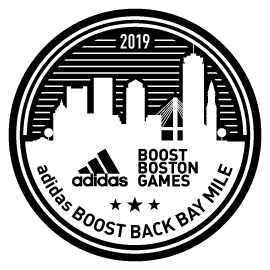 As Part of the adidas Boost Boston Games, the five-lane track will have Olympic and World Champion track athletes competing at the conclusion of the mile races. This road mile welcomes all ages and abilities to participate. MBTA: Orange Line or Commuter Rail to Back Bay Station and the Green line to Copley Station. Visit https://mbta.com for more information.